Downhill skiing is an exciting sport and a fun activity, but as with any sport it is important to choose the right equipment. Downhill skiing requires a different type of equipment than cross-country, snowboarding and other wintertime activities. Newcomers to the sport are often daunted by the sheer number of choices available, but there are some guidelines available to make selecting the perfect skis a bit easier. Before you can choose the perfect downhill skis, you first need to evaluate your skiing style. What type of terrain are you most familiar with? Do you prefer the groomed runs and convenient lifts of Alpine skiing, or do you prefer the excitement of back country skiing? Do you love showing off your skills in so-called park-and-pipe ski areas – specially designed terrain parks complete with jumps and other challenging obstacles, or do you prefer the fun of freestyle skiing? How you answer these questions will have a big impact on the type of ski that is best for you. For instance, the skis sold under the moniker "All Mountain" are best suited for skiers who spend most of their time on groomed runs. These downhill skis, sometimes referred to as carvers, are also a good choice for skiers who like a combination of groomed runs and powder conditions. All-mountain skis have a number of advantages for these types of skiers, including the ability to hold their edge on groomed runs and hard-packed snow. In addition, even novice skiers find it easy to turn on these types of skis. Most all-mountain skis come with integrated bindings designed to naturally flex with the ski for easy turning. On the other hand, all-mountain skis may not be a good choice for high-performance skiers, including those who prefer the fun of deep powder and those who expect to participate in park-and-pipe skiing. All-mountain wide skis are similar to the all-mountain variety, but they are better suited to those who wish to do some mountain skiing as well as groomed runs. The wider stance of these skis adapts well to powder conditions, without sacrificing turning ability on hard snow. All-mountain wide skis also do better in slushy conditions, such as those found in mountain skiing. The downside is that wide skis are not quite as nimble, and beginners may have a harder time turning. Most all-mountain wide skis are sold flat, but some models are available with integrated bindings. As the name implies, powder skis are best suited for deep, light snow conditions. Skiers who prefer powder but sometimes mix it up with groomed runs are often fond of these skis. Powder skis are designed to create the largest possible surface area – a critical factor when moving through deep snow. Powder skis are nearly unsinkable, even in the deepest snow. They are not, however, designed for precise maneuverability, and they are generally not suitable for groomed runs. Some skiers prefer the fun and safety of groomed runs, while others love the adventure and excitement that only backcountry skiing can provide. Backcountry skis are designed with those adventurers in mind. These skis are best suited for those who prefer wilderness terrain, although powder and even groomed run enthusiasts can use them as well. These skis are built with a narrower waist, making turning easier when skiing on hard snow. Backcountry skis also tend to be lighter weight than other skis. This weight difference can be a big advantage when climbing in rugged mountain terrain. Twin-tip freestyle skis are designed for skiers who love the park-and-pipe experience, with its jumps and obstacles. Twin-tip freestyle skis are also great for groomed runs and powder skiing. These skis are designed to hold their edge in a pipe, but they also handle quite well in powder. In addition, twin-tip freestyle skis also soften the impact of landing off a jump – an important consideration for both competitive and recreational use. It is important to note that twin-tip freestyle skis are designed to be used with the skier centered on the ski. Skiers who are not used to this position may find it odd at first, but most people will be able to adapt quickly. When you start shopping for skis, you will probably see skis that are marketed to different ability types – i.e. beginner, intermediate and advanced. While this can be helpful, it is important to note that most modern skis can be used by people of virtually any ability. That having been said, most novices will probably be comfortable on all-mountain skis, which are designed to turn easily. In addition, novice skiers tend to stick to the groomed runs that these skis are best suited to. In the end, it is best to match the downhill ski to the type of condition the rider be experiencing – powder, groomed runs, mountain, backcountry, rather than the level of skiing experience. Modern skis have become very specialized and very high–tech, and each type of ski is designed with a specific set of skiing conditions in mind. - Hello, welcome to Kunstadt Sports. 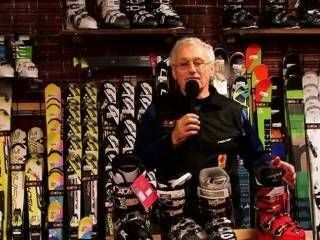 My name is Peter Kunstadt, and we are here today to give you an overview of skis and bindings. At Kunstadt Sports all our employees are athletes, and many employees are ski racers. Here with me is Zoë Newell who is an excellent ski racer. A great person except for the days when she beats me in a race. - Today we're going to be telling you a little bit about how to select skis for your individual abilities as well as show you the difference between recreational skis, performance skis, and racing skis. Before we get started we need to go over a few concepts that'll help you understand the geometry of modern skis. First we have our ski length, that is the measurement from your full tip to tail. Next is your running length which is the point where the ski actually initiates contact with the snow. Next is our tip width which is the width of the tip. Next is the waist width which is the width of your waist of your ski. And finally the tail width, which is the width of the tail of the ski. These numbers are extremely important on the ski because it helps determine the radius of the ski. - Over a decade ago the concept of a parabolic ski was introduced and that was definitely a revolution in ski design. The parabolic shape basically means that the edge of the ski is made in the shape of a parabola. And that in turn means that when a ski is flexed, in the flexed position the edge creates a regular radius or a continuous radius. And that radius is then defined by the length of the ski, by the tip, the waist, and the tail width. - Another important concept in determining ski geometry is the camber and rocker. The simplest way to explain camber is if you were to take a piece of string from your tip of your ski to your tail and measure the distance between the string and the center of the ski, will determine the amount of camber in the ski. Another way to fully understand camber of the ski is with this demonstration. As you can see that both the tip and the tail are in contact with the floor and the center is not. The distance between the floor and the ski is your camber in the center. - The rocker, also known as reverse camber, is as the name suggests, the opposite of the camber. The tip, instead of being bent down is bent up ever so slightly. It's very hard to demonstrate on the type of skis that we have in our stock. The tip is lifted up to ease initiation of turns. - We are now going to move on to specific categories of skis. These include recreational, performance, racing, and speciality skis. - Here are some examples of recreational skis. So what a recreational ski has is generally light weight, a short radius, and these skis are generally soft for easy operation, for easy skiing. Of course the price you pay is a little reduced performance but there is definite comfort in skiing on a recreational ski. - Our next category is performance skis. Performance skis are generally stiffer. As well as they come usually in a variety of different radiuses, depending on your skier performance as well as ability. They also come with a few more technologies compared to more of your recreational ski. Peter here will go over a few of the technologies in the Elan and Fischer skis. - Thank you Zoë. Fischer came a few years ago with the concept of a progressive ski. The edge design is exactly what that name suggests. The edge is progressive. It is not a constant radius. There is a variety of radii in that ski to ease initiation and to have the ski feel like a cruising ski at high speeds as well. So it's a very good combination of easy initiation, easy turning, and high speed performance when that is required. On the other hand, Elan came up with a very innovative combination of shapes of edges and they call it Amphibio. The concept in Amphibio is that the active edge on the ski is cambered like a regular performance ski, and it feels just exactly like a performance ski. On the other hand though the outside edge, and now we have introduced a right ski and a left ski because we have to maintain an inside edge and a separate outside edge. The outside edge is rockered ever so slightly which makes for very, very easy initiation and also the feeling or the phenomenon of catching an edge is a thing of history. Catching an edge basically means that the skier stepped on the wrong ski in a turn. And the wrong ski, theoretically wrong ski, does not have that edge to catch because it's rockered away. So this is a very, very user-friendly ski, easy to initiate, easy to work with and still offering a very high performance. And last but not least, here is Atomic's Doubledeck. The concept of a Doubledeck here is that they added a piece of plastic on top of the ski that's attached to the ski loosely with elastomer. And what's interesting about it is that this elastomer gets engaged only when a ski is flexed. So as the ski is flexing, as the flex increases, the stiffness of the ski increases as well. And so the ski actually responds to the temperament and the style and the power of the skier. So the ski changes from an easy ski to a stiff ski as the skier increases pressure. - Our next category are race skis. Race skis are the simplest ski on the market today. They have a sandwich construction, basically meaning two sheets of metal and a full wood core stacked on top of each other with a very simple, stiff riser plate on top. Race skis generally are constructed with a full side wall as well as improved base material to make the skis go faster on ice. Our last category is specialty skis. Specialty skis are made up of a variety of different types of skis. First we have a twin-tip, which is what Peter is holding. A twin-tip is usually used in a park or if people want to ski backwards, they have a tip at the tip as well as a tip at the rear for easy backwards skiing. - Ideal for people who don't know which way is forward and which way is backward. - Next is junior skis. Junior skis are generally 70-130 centimeters. They are soft, usually about the softest ski on the market. Easy for turning and easy to learn how. Generally for most junior skis they all have pretty cool graphics as well to make it fun for the kids. Our next category is women-specific skis. Women-specific skis again are usually have better graphics, kind of zoned in for a woman skier. As well as they are sometimes softer for easy turning and easy skiing. As well as the biggest difference between a women-specific ski is going to be the binding is generally moved up ahead on the ski about a centimeter for a little bit better balance points for a woman. - There are many other specialty skis that we are not going to specifics into here. But there are for instance mogul skis that are built softer without any carving shape. And they are soft so that the tips don't hit into the moguls. They're easier to maneuver in moguls, they're usually short and narrow. The other extreme are powder skis that are extremely wide, over 100 millimeters often wide, and very frequently they are rockered for easy turning. And of course in a powder situation there is no need for carving, and so these skis are not made to carve, they are made to float nicely in deep snow. And there are many other specialty skis that we don't mention. - Another very important factor when choosing a ski for you is the ski length. Ski length is very important in determining how the ski is going to perform on the snow. Generally a ski with a radius of 14 or smaller will be a length to about your nose, as seen here with Peter here. With a radius of 14 and under, it's a very small radius meaning very small turns on the hill. Having a shorter ski is a lot easier for you to be able to maneuver around your turns. A ski with a radius bigger than 14, you usually want to go about around your height of your head. This means your radius is a lot bigger, meaning longer turns. You need a longer ski to be able to support your entire turn. Mostly for kids and beginner skis it's always good to have a ski around nose length and shorter. Makes it a lot easier for maneuvering as well as easier to learn how to ski on the snow. - The introduction of carving ski made it necessary to lift the ski boot off the ski to a certain degree in order to avoid the boot touching the snow when the ski is carving to an extreme point. This is achieved generally either by a riser that is added to the ski like here, or a combination of a riser and a binding that has a riser built in it as well. Practically all ski manufacturers introduced integrated binding systems. The advantage of an integrated binding system obviously first of all is that the binding works with the ski specifically and ideally. Of course the disadvantage to the user is that they lost the freedom to choose what type of binding would they select after they've selected their ski. Another concept that became necessary with the introduction of carving skis is the floating binding. It is necessary because of the decreased length of the ski for the whole length of the ski to be functional. And that is achieved by allowing the binding to float. In this particular case the toe is floating freely in the rail and so is the heel, floating freely in the rail. And the binding actually is attached to the ski in the center. So as the ski flexes both the toe and the heel freely float on the ski, thus letting the ski function completely over the whole length of its edge. Now that you have selected your skis and bindings, it's time to select your boots. There is a follow-up video on boot selection. When you have selected your boots, skis, and bindings, then it's time to get your binding adjusted to your boots by a professional technician. Here at Kunstadt Sports, all our technicians are licensed and highly professional. - If you're still in doubt please check out our website, www.kunstadt.com for local on-snow demo days where you can try out our skis and see which one works best for you. In this video, Peter Kunstadt and Krista Bellinger of Kunstadt Sports, will guide you through the many choices of ski boots available, as well as the process of selecting the proper ski boot for you. In this video, Peter Kunstadt and Krista Bellinger of Kunstadt Sports, will guide you through the process they use to fit a skier to a ski boot, thus ensuring comfort and maximum performance.